MM32 Light Modelling Paste is a new modelling compound that has the same qualities as our regular impasto medium but with a lighter body and finish. Like traditional impasto products, Light Modelling Paste is used to build relief and texture and it can be used on its own or mixed with paint, ink or pigment. Light Modelling Paste is lighter in weight than regular impasto. Light Modelling Paste dries to a matte white finish unlike Impasto, which dries to a cream, satin-gloss finish. Both take acrylic paint well. Both can be blended together for interesting textural effects. The slight texture of the Light Modelling Paste makes it suitable for use with dry pastels where the texture of Impasto may be too smooth to be suitable for this purpose. Many artists use texture as means of expression in their paintings. Acrylic paints are generally known for their thicker consistency. However, they may not be thick enough to create the kinds of tactile textures sought by an artist. Although MM2 Impasto Medium is used to increase the body of acrylic paints, modeling compounds are sometimes needed to achieve more highly textured surfaces, as they retain the indentations and peaks made when applied and manipulated. Derivan has created a unique variation on traditional impasto mediums called Light Modelling Paste. As the name suggests, this product contains a lighter-density filler that results in a lighter version of MM2 Impasto Medium. It dries to an off-white opaque finish with a grainy, absorbent surface. This product is particularly good for creating high peaks of varying sizes; it is flexible and does not shrink when it dries. It is compatible with all Derivan acrylic paints and products (ie: Inks) and comes in 250ml screw-top jars. 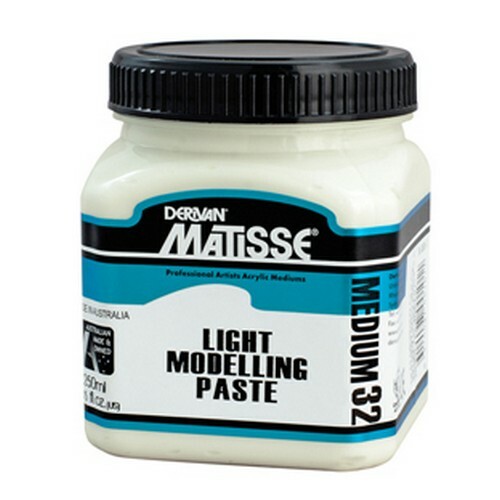 MM32 Light Modelling Paste is a very light product in terms of weight and can be used in large quantities that will not cause canvas to stretch or sag. Straight from the container, Light Modelling Paste is a frothy, grainy compound that can be applied with either a firm-bristled brush or palette knife. Although this medium can be applied to all rigid substrates (ie: board, canvas panels, etc), its light texture and flexibility makes it an excellent choice for applying to thick paper as well as canvas. It is non-toxic when used as directed. Unfortunately, it is not suitable for use as an adhesive. In terms of basic instruction, the uses of Light Modelling Paste are many. The most effective is to apply it straight from the container using either a firm bristled brush or a palette knife. Once dry, you can paint directly onto the surface with any of the Derivan or Matisse acrylic paints, creating a colourful, textured surface. Paint can also be mixed directly into this product. MM32 allows for free intermixing with Matisse colours in any proportion. There is very little visual colour loss when up to 20% of MM32 Light Modelling Paste is mixed into Matisse colours. It is important to note that the opaque, semi-matt nature of MM32 will, sometimes, visually affect the result of mixtures with a higher proportion of medium to paint. Pastel tones of the original colour or reduced refraction levels may be apparent. Testing and experimentation is recommended to ensure application of mixtures are suitable to individual art projects. Light Modelling Paste can also be painted whilst wet and then scored, creating white marks, once overpainted, where the scoring lines are present. Spread a thick layer on to a surface with a palette knife. While still wet, lightly apply a layer of acrylic paint to the surface with a soft brush, and then use the back end of a brush to draw lines into the surface. Some of the paint will bleed into the indentations, but there will be a contrast between the painted surface and the white paste underneath. The unusual porous surface of Light Modelling Paste also allows the artist to experiment with unique watercolour finishes. After the paste has dried, cover the surface in a light wash of water and then apply either watercolor or acrylic paint. The paint will start to bleed and stain into the surface in much the same fashion as watercolour does. This feature enables watercolour artists to incorporate unique finishes into their works by using Light Modelling Paste to add texture to certain sections while allowing for a consistent watercolour finish. Inks can also be used to similar effect and Derivan has a range of Matisse Artist Quality Inks that are highly pigmented and perfect for use with this product. This porous surface of Light Modeling Paste also makes it suitable for use with both dry pastels and oil pastels. As previously mentioned, it can be tinted with acrylic paint to create a customised colour surface for pastel use. Although the absorbent surface is a key feature of this product, this can be minimised if required with the application of either MM7 Polymer Gloss Varnish & Medium (water-based) or MM6 Polymer Matt Varnish. After the paste has dried, apply a minimum of two coats with a soft brush. An additional full range of Derivan and Matisse acrylic paint mediums is available and there is no reason why they cannot be used together with MM32 Light Modelling Paste. For example, the Impasto Medium and the Light Modeling Paste can be used to different textural effects on a beach landscape. Impasto Medium creates swirling, textured waves, while the grainy finish of Light Modeling Paste can be used to create sand. Derivan water based varnishes can also be used over all mediums to seal the entire painting and create either a matt, satin, or gloss finish. Light Modeling Paste is easily cleaned up with soap and warm water while wet. It is much harder to remove when dry. Keep any utensils wet while in use. As with many mediums, it also highly susceptible to evaporation and thus the cap will need to be replaced when not in use. Matte and slightly rough to the touch. Approximately 2 hours to 6 days, depending upon the thickness of application and ambient temperature and humidity.